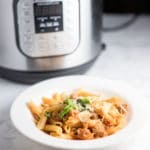 A quick and easy pasta from the Instant Pot. Set the Instant Pot on saute setting and pour olive oil into the Instant Pot. Squeeze the turkey sausage out of its casing, add the sausage to the Instant Pot and break it up with a wooden spoon as it cooks. Add the diced onion and diced green pepper to the instant pot. Stir and cook until the sausage is no longer pink. Lock the lid on the Instant Pot, switch the valve to sealed position, and set the Instant Pot to cook on high pressure for five minutes. When the Instant Pot finishes the five minutes of high pressure cooking, immediately release the steam by switching the pressure valve to venting. Stir the pasta and sauce to mix it all together. Top with basil and parmesan when serving, if desired.